Two new assaults just came in...train or trash? I got this two from some calls and as always (even with help of the wordpress site...) I´m not sure if it makes any sense to train them, or just go for the tokens. 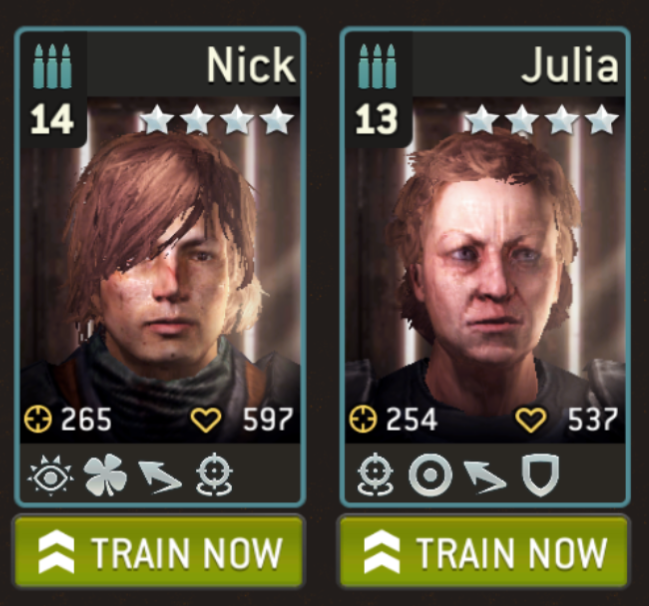 If Julia turned over Luck on that last trait she would be incredible. Big gamble tho.... Too rich for my blood. Julia gets luck and she is perfect! I'm on the verge of a 7* with those exact traits! That being said, Nick would be a big disappointment if he pulled anything other than Marksman. 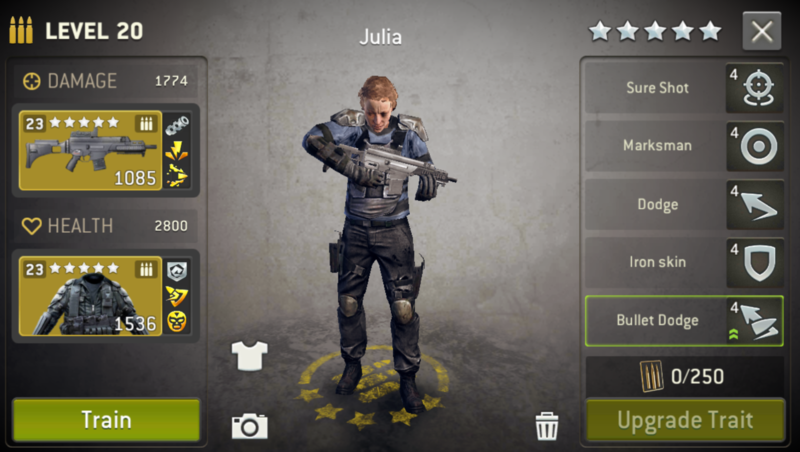 Julia has the chance of being perfect with a Luck pull (Love that Luck/Sure Shot stack), and a solid #3 Assault in the @Invader lineup if she pulled any of the other traits. Having an Assault with Sure Shot is a nice option to have. The only trait that would really piss me off would be Bullet Dodge (His other Assaults have that trait if he really needs to bring that to bear). Yeah, Julia's a keeper if you get luck as that last trait (I've got one with those five traits). Like @tabernac, I've taken that plunge many times, often failing, but when you get that perfect fifth trait, you feel pretty good about it. I'd stay away from Nick. Since assaults already have low damage, utilizing overwatch with an assault is a waste of a trait, IMO. Plus, marksman is a must-have for assaults--you could get it for your last trait, or you could get defensive stance. If it was my choice, i would kick Nick in the b**tt. Promote Julia and hope for the best (bullet dodge). Later on (when Julia is 5* - with a final descent trait) I also would scrap Steve or Beverly for her token since they don't have "sure shot" and "luck" I don't trust anymore. Cheers man and please inform us about your decission. Don't be afraid of defensive stance ! Agree with JB here. Luck would be divine, followed by Defensive Stance. I'd much rather have DS than Vigilant or Bullet Dodge on an Assault.